Custard Puff is basically a cream puff with a custard filling, I just prefer custards on puffs pastries as compared to cream. So what is cream puff? it is a choux pastry filled with cream then garnished with chocolate, caramel or powdered sugar, it is also known as profiterole or choux à la crème. A really good and light pastry enjoyed as a dessert or even as a snack. Trust me this is so good and so light we made 8 pcs at home during the evening it was gone before sunrise the next day. In a large pot add water and butter bring it to a boil. Add in the flour and salt until mixture form a ball. Transfer the dough to a mixing bowl then using a mixer, add eggs one at a time making sure eggs are well incorporated after adding the next. Once done, place a tablespoonful of the dough to a baking sheet. Then bake in a 220C preheated oven for 20 to 25 minutes or until golden brown. Remove pastry from oven then set aside. In a sauce pan mix together milk, cream and vanilla extract. Turn on heat to medium then continuously stir until hot enough but not boiling. Remove sauce pan from heat then set aside. Beat eggs yolks, corn flour and sugar in a bowl until mixed evenly. Pour hot milk to the egg mixture while whisking continuously. Place the mixture back to the sauce pan then cook in very low heat for 15 minutes or until the custard form. Once it forms set aside and let it cool. Cut pastry in half, you should then place a heaping spoonful of custard mixture in the middle. Add more according to your liking. In a double boiler melt chocolate together with the condensed milk. Once melted drizzle over filled pastry. Chill puff pastry before serving. I feel like going out and just simply buy anything that has the same taste as this one..
Lovely and killer it looks Raymund, I will drool for the custard minus the bun. 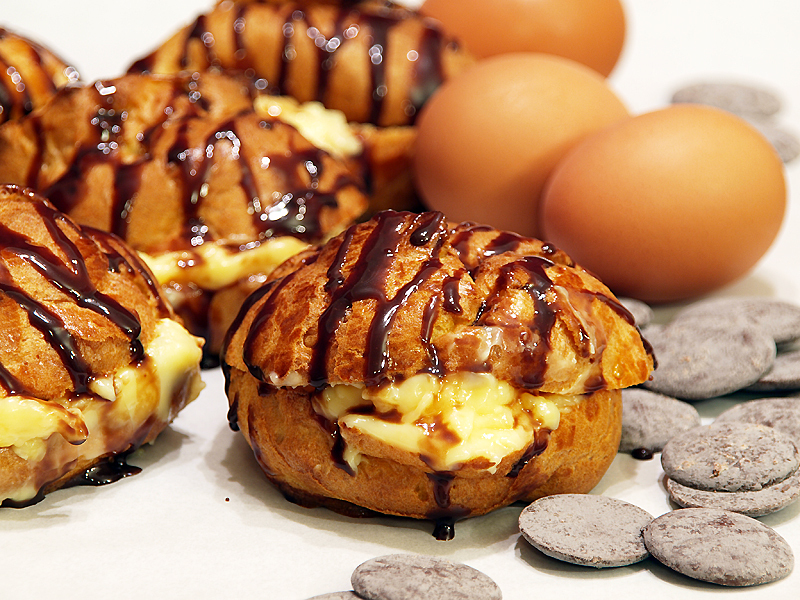 I love custard puffs and yours look fantastic with the chocolate drizzle on top. One of my favorite indulgences! The custard puffs look gorgeous. I can see why they wouldn’t last long…totally irresistible. I love custard! I’m the same way. Give me a choice between custard and cream filling and I’m going custard every time. This remind me of mini bostom creme donuts. Wow this shot is really sharp, Raymund! Great job on the lighting too. Well done! Thanks, I am learning a lot from your great food photos, thats why I am starting to change a bit and add items on the background, my only problem is that I usually cook around 6PM and theres no more daylight, its hard to get the right balance with warm white lights, any tips? Anyways summer is near so sunlight will still be available until 9PM. Nothing will beat natural lighting but if you must shoot at night, you may want to consider tabletop lights. The best one that I can personally recommend is Ego lights by Lowel (http://www.lowel.com/ego/). I do use softboxes but that is on a more permanent studio and bigger projects. Try ego lights first and get a feel for it — it will make a big difference. Check some of the few shots where I used this light. I love the topping so simple and rich too. Great recipe. I’ll take two, please 🙂 How yummy! Now those are some rich looking little puffs! So decadent. I’d love some this morning! I’m not necessarily a clustard fan, but I can appreciate these because a close friend is crazy about them. good recipe. It goes without saying that these look delicious, but my favorite thing about them is that they look like cartoon monsters. Wow! this is my favorite. Can i use your recipe… please!!! But what if we don’t have mixer? is that ok?